What can YOU do to advance the employment of people with disabilities? 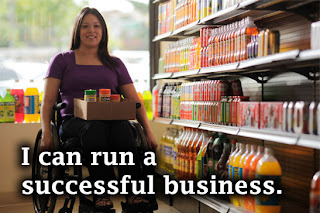 Because myths and stereotypes about disability employment continue to create barriers to opportunities for qualified people with disabilities, the Campaign for Disability Employment launched “What can YOU do?” (WCYD) – an initiative to encourage everyone to elevate perceptions about what people with disabilities CAN do on the job and to emphasize the value and talent people with disabilities add to businesses and organizations. A key part of the WCYD initiative is the “I Can” public service announcement (PSA), a montage of seven people with disabilities – some apparent and some not – sharing what they CAN do on the job when given the opportunity. “I Can” reflects the diversity of skills people with disabilities offer, challenges common misconceptions about disability and employment and reminds everyone that at work, it’s what people CAN do that matters. Click the photo of Patty above to see the video. Share it with everyone you know!